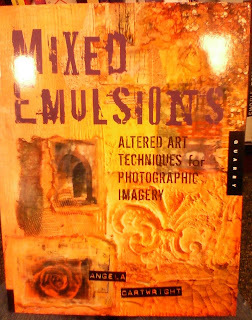 We were at the bookstore (Barnes & Noble) on Monday and as I was looking through the knitting books (I know, surprise, surprise) I stumbled upon a book that was in the wrong place- it was all about manipulation of photographs for use in scrap booking. I have always been interested in photography - so it piqued my interest. I left without buying anything - but couldn't stop thinking about that book. SOOOO... last night, I returned to find that book. Of course, the other question I have raised for myself regarding this type of work is where does it go when I'm finished - there's only so much room in the house for three dimensional art to be displayed... This doesn't stop me though.. 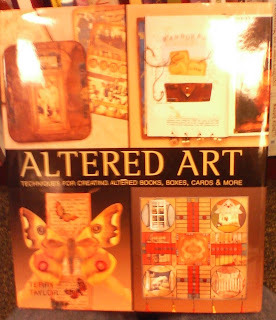 I still want to make some pieces - and I will! I don't know how long it'll be before I actually start to use these books - but the references are safe in my library now - waiting for inspiration to strike! Wow, sounds exciting. Good luck with the new craftiness! Of course you realize that now you will spend the rest of your life looking for that book. I have learned through experience that a craft room, while a good thing, does not save the rest of the hopuse from creative clutter. It just gives you a place to put everything when you clean up for company, after which it all creeps out again all on its own. Have a good weekend- I'm going for birthday cake tomorrow.